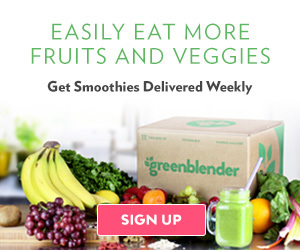 Disclosure: I received a one-week GreenBlender subscription complimentary for review. This post also contains affiliate and referral links where I earn a small commission to help sustain Realm of Vibes. Thank you for your support. Every Sunday, I wash, cut, and prep for a week’s worth of fruit for smoothies. They are super basic: water, spinach, and berries. Sometimes, I will add a vegetable (usually cucumber), a piece of ginger, chia seeds or a drop or two of essential oils. My husband never complains, so I keep creating the same concoctions in my Blendtec (The Blendtec, in my humble opinion, is the best blender on the market – and I have tried almost all of them). GreenBlender also focuses on sourcing from organic farms, urban and local farms, green markets, and vendors who value sustainable practices whenever possible. I live near farms and really try to buy locally to support real people, rather than big businesses. GreenBlender costs $49.90 USD per shipment, but with my referral link, you will get $20 off a new subscription. That’s amazing! It is totally worth giving them a try at $29.90 USD! I added 1 cup of water, the blueberries, banana, summer squash, amia powder and ice to the Blendtec and within a minute, had a perfectly blended smoothie. I never had heard of amla powder before, so I learned about the abundance of nutritional benefits. Amla powder is safe for pregnancy, too. I never made a smoothie with summer squash and was pleasantly surprised. The Blueberry Punch smoothie had the right amount of sweetness and was not only a beautiful start to my morning but a great way to be introduced to GreenBlender. I hate peeling mangos, so the prep took me a little longer today. Otherwise, It was happy to use kale, acai berry, flaxseed, and a banana. It was very creamy, sweet, and perfect to increase my energy, glow, and immunity. Absolutely delicious! It was my first time ever using collard greens and basil in a smoothie and I was left wondering why I hadn’t. What I like about GreenBlender is that I feel that the chefs really create out-of-the-box recipes that actually work! The Orange Berry Basil is your quintessential green drink; I noticed it was a little gritty, but then remembered I forgot to add ice. User error! Otherwise, it was super tasty and I would absolutely make this again! Since I am now an expert in cutting mangos, the prep was 2 minutes shorter today. Mangosteen Morning included baby spinach, cantaloupe, kiwis, mangosteen powder, coconut flakes, ice and water. This smoothie was not as sweet as the others, and a little gritty. I wasn’t sure of the organic shredded coconut should have been blender or used as a garnish. It was a little gritty, and my least favorite of all the smoothie choices, but I drank all of it since it has immune boosting benefits. This smoothie boasts anti-inflammatory and high fiber benefits. It also is low sugar, perfect for my gestational diabetes. I thought the combinationof the collard greens, pear, cucumbers, mint, lime, chia seeds, water and ice was super light, fresh, cooling, and a great start to my morning. My husband, Jason, said, “There are a lot of flavors in here, and it tastes really good!” If he compliments it, it must be good! I love GreenBlender. Not only are these recipes easy, but the flavor profiles are so different and versatile – I wouldn’t imagine coming up with some of the recipe combinations! I feel that the chefs really make sure they are holistic, healthy, and delicious. I also love all of the different options. I am excited for my next box! If you would like your products featured on Realm of Vibes, contact realmofvibesdg@gmail.com or visit the Contact page. Wow what are the odds that I have been looking for a blender!!! This sounds amazing I will definitely have to try it out! Thanks! I love how creative the recipes are here! Much different than the same old stuff you see everywhere. Seriously, I’m glad you posted about this. I’m going to use your referral link when I’m ready. I’ve been thinking about a subscription like this for smoothies. Not sure they have this in the UK but it looks nice. Not in the UK yet but you can sign up for their newsletter to see when and where they expand! Mmmm love smoothies! These look so yummy! It’s perfect – every morning I pulled out the labeled bag, did a little prep work, and voila, smoothie! Delicious and nutritious! Please let me know what you think if you give them a whirl. These look like really really yummy smoothies! Thank you so much for the discount code, I am going to sign up and check this out. They were a great way to start the day! I can’t wait to hear what you think! Glad to introduce you to Greenblender! Make sure you use my referral link to get $20 off your first box! This sounds absolutely delicious with such creative recipes!! Orange Berry Basil sounds super fabulous!!! They were really yummy and a great way to start the day! Thanks for reading and commenting. Omg my dad would love this for fathers day! he has always been into juicing since I can remember! Thanks for sharing!!! These smoothies look so yummy. I would love to try it. Thanks for sharing. They were a great way to start the morning! Hopefully you give it a whirl through my referral link! Thanks Ophelia! I love the mangosteen smoothie! I’ll check out if we have green blender here in PH. I never had mangosteen so it was really a great first experience. Right now, Greenblender is only in the USA but they are expanding! You can never go wrong with making a smoothie! Thanks for reading and commenting! Never heard of this and I loveee smoothies!! This is great! Sounds like a good investment! And that blueberry punch smoothie is making me thirsty… Yum! Can’t go wrong for $29.90! It was a really tasty batch of smoothies! I don’t even know if we can actually subscribe to smoothies ingredients delivered to your home, that actually a neat ideas! It definitely is innovative! Let me know if you give it a try! These recipes are health and power packed. I liked the good mix of ingredients. Need to try out Green Blender now. Let me know what you think Indrani! For $29.90, it is definitely worth a try! I have been using frozen fruit from my smoothies. Who knew you could have the ingredients brought to you? I sure didn’t! Very cool. The recipes look delicious. I have heard great things about Greenblender products, I need to give them a try! I really enjoyed all of the smoothies! I hope you give them a whirl for $29.90 — I don’t think you’ll be dissapointed. This is interesting. This is a fantastic idea but unfortunately, it is not offered in my area. Instead, I would be glad to make one on my own. Thank you for the inspiration. That stinks! Make sure you join their newsletter so you will get notified when they are in your area. Thanks for reading and commenting. I always say I’m going to do a smoothie detox, but never want to shop for the ingredients or prep. A service like this might be the answer. Thanks for sharing, definitely will check them out! Victoria – this was an awesome start to my day, especially for the introductory price of $29.90 – it takes the thinking and prep out of the equation. Let me know what you think if you give them a whirl. I love it for that reason exactly! Be sure to let me know if you give it a try! Let me know your thoughts after you give it a try! Thanks for reading and commenting!